A high-fibre nutritional formula in easy-to-take capsules. 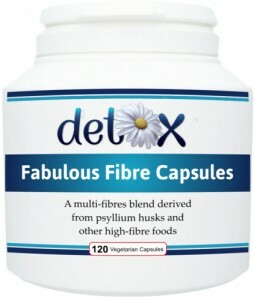 The fibre is derived from psyllium husks and seeds, flaxseed, prune juice, figs and other high-fibre foods and herbs. Not only will this fibre complex provide the user with a healthy combination of both insoluble and soluble fibre (essential for maintaining a healthy digestive system and bowel regularity), it will also supply an abundance of nutrients like Omega 3 and Omega 6 Essential Fatty Acids, calcium, potassium and complex carbohydrates. 3 - 8 capsules per day or as required. To be taken with a minimum of 250ml of water. Ideally taken before an evening meal or total intake can be split over 2 meals.